Wilmcote house provides over 100 homes largely in the form of 3 bedroom maisonettes, which are arranged across 3 blocks linked via two main stair cores. It is located in the central Portsea Island area of Portsmouth. The building is owned and managed by Portsmouth City Council. Wilmcote House was built in 1968 using a prefabricated reinforced concrete sandwich panel system; it is in need of significant repairs, including some structural work, without which the remaining life of the building is likely to be around 30 years. The concrete sandwich panels incorporate only around 25mm of insulation, which combined with all electric heating means staying warm in the building is expensive; many residents experience fuel poverty. Wilmcote House will be split into three thermal envelopes with the two stair cores remaining outside the thermal envelopes in order to simplify the detailing required. External walk ways will be enclosed within the thermal envelopes of the blocks in order to improve the area / volume ratio, make the detailing simpler and thusmore cost effective. Internal balconies that exist on alternate stories, those between the walkways, will also be enclosed, increasing the size of the maisonettes and again and simplify detailing. The three blocks will be made airtight using an external membrane before an external insulation system is applied to each block. Each dwelling will be provided with individual MVHR systems. Existing heating systems will be retained for the time being due to resident familiarity and budgetary constraints. Heating could be addressed as and when the current systems reach the end of their lives, in accordance with the step-by-step approach taken by EuroPHit. Ground floors will also not be insulated at this stage but could be considered in a future ‘step’. Wilmcote house provides over 100 homes largely in the form of 3 bedroom maisonettes. The homes are arranged in 5 levels (10 stories) across 3 blocks linked via two main stair cores. It is located in the central Portsea Island area of Portsmouth. The building is owned and managed by Portsmouth City Council. Wilmcote House was built in 1968 using a prefabricated reinforced concrete sandwich panel system; it is in need of significant repairs, including some structural work, without which the remaining life of the building is likely to be around 30 years. The concrete sandwich panels incorporate only around 25mm of insulation, which combined with all electric heating means staying warm in the building is expensive; many residents experience fuel poverty. The existing floor area is 10,233m2.External insulation will be applied to the exposed façades of the building, excluding the stair cores which will fall outside the thermal envelopes created. A steel frame, resting on new foundations at ground level, will be fixed to the rear elevation, enclosing the existing walkways and balconies and providing a suitable structural plane into which the windows enclosing the walkways can be installed, and the new insulated façade can be fixed to. On the front façade, insulation will be fixed to the existing structure; the proposed wall build up following refurbishment is shown in the following sketch.Existing windows and doors are to be replaced with Passive House certified windows and doors, including insulated doors from the stair cores into each of the newly enclosed walkways that provide access to each dwelling. Front doors to dwellings will open into communal space that has been enclose within the thermal envelope thus these doors need not be certified or insulated.Pre refurbishment testing has shown that Wilmcote House is reasonably airtight for an existing structure built without regard to a particular airtightness standard. The refurbishment strategy is to install an air tight layer around the building before the application of the external wall insulation system. Details will be developed by the design team from April 2014 onwards.Each dwelling will be provided with individual MVHR systems. Existing individual space heating systems in the form of electric storage and panel heaters will be retained for the time being due to resident familiarity and budgetary constraints. 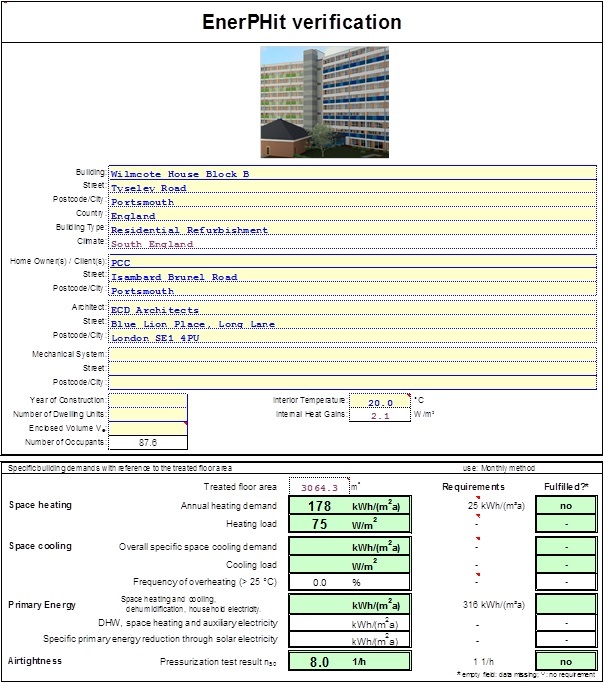 Surveys of residents suggest that they are keen to ensure sufficient provision of heating.Work began on-site in August 2014 and is expected to be completed in September 2015. 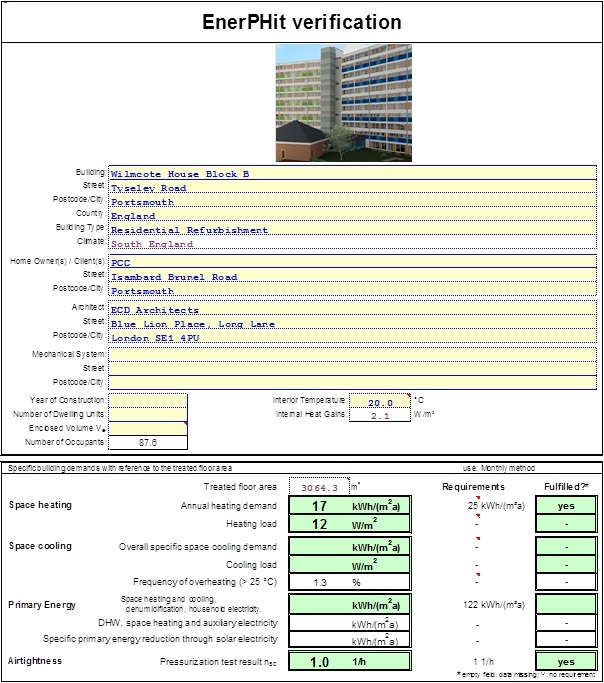 Improving the building to the demanding EnerPHit standard involves a number of challenges; how to insulate the rear façade which features integral but exposed walkways without introduction thermal bridges, how to provide appropriate and effective ventilation and how to provide cost effective heating in a building with limited space for communal services and whose structural characteristics proscribe the use of gas. Wilmcote House will be split into three thermal envelopes with the two unheated stair cores remaining outside the thermal envelopes in order to simplify the detailing required. External walk ways will be enclosed within the thermal envelopes of the blocks in order to improve the area / volume ratio and make the detailing simpler and thus more cost effective. Internal balconies that exist on alternate stories, those between the walkways, will also be enclosed, increasing the size of the maisonettes and again and simplify detailing. The three blocks will be made airtight using an external system before external insulation is applied to each block. For structural reasons related to the prefabricated concrete panel system used to construct Wilmcote House, the existing reinforced concrete ground floor cannot be broken up to allow insulation to be installed beneath a new slab – such a course of action could destabilise the building. The finished floor to ceiling height is insufficient to insulate over the slab thus ground floors will not be insulated. 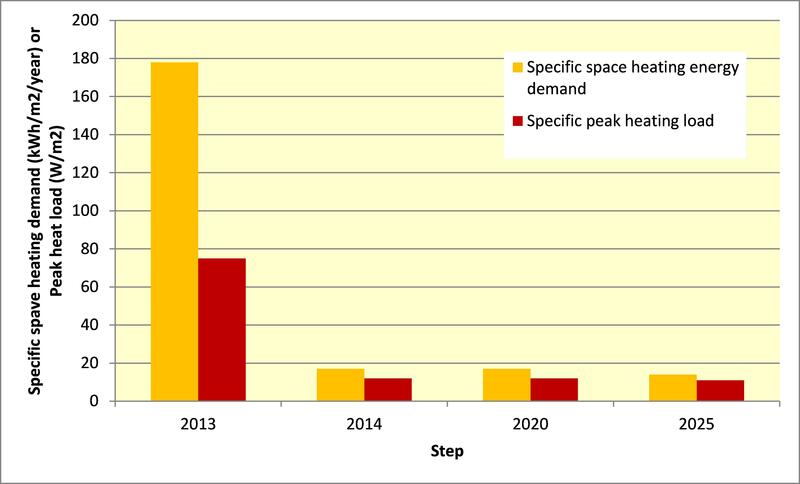 This could be a future refurbishment step following any potential reduction in the cost of very thin, high performance insulation. Heating system improvements could be addressed as and when the current systems reach the end of their lives, (however there is little to go wrong with them), in accordance with the step-by-step approach taken by EuroPHit. The ventilation of the enclosed communal spaces is currently being considered by the design team.